The creation of customer value is a marketplace advantage important to retailers (Benhamza Nsairi 2012; Gallarza et al. 2016; Ney 2015). The literature indicates that shopping behavior may lead to perceived customer value (Irani and Hanzaee 2011). 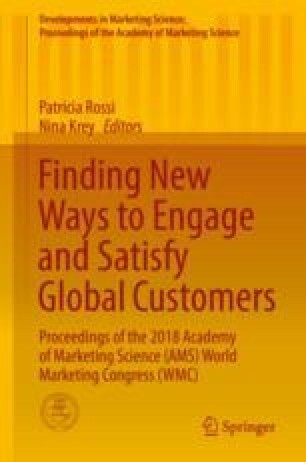 In this research three types of shopping behavior are examined as antecedents of three dimensions of value that are related to resulting satisfaction with the store. Price-conscious shopping behavior represents an economic orientation where shoppers seek to achieve the best economic value in products they purchase. Recreational-conscious shopping behavior involves shopping behavior that is related to seeking inherent satisfaction with the shopping activity (Kaltcheva and Weitz 2006). Impulsive-careless shopping behavior occurs when a consumer makes a purchase with no previous intention of the purchase and/or consideration of alternatives (Bayley and Nancarrow 1998; Beatty and Ferrell 1998). The three dimensions of perceived value are based on the conceptual work of Sheth et al. (1991) and the empirical work of Sweeney and Soutar (2001). Emotional value is defined as the perceived utility from an alternative’s capacity to arouse feelings or affective states (Sheth et al. 1991). Price value is associated with products that are reasonably priced, offer good value for the money, and are economical (Sweeney and Soutar 2001). Social value represents the utility derived from enhancing the customer’s social self-concept (Sweeney and Soutar 2001). Store satisfaction represents the customer’s overall satisfaction with the retailer and the quality of the merchandise or store (Dabholkar 1993). The analysis was based on an online survey instrument administered to a customer panel consisting of 155 shoppers at Target and 153 shoppers at Wal-Mart totaling 308 respondents. The results indicate that price-conscious shopping behavior was associated with emotional and price value but not with social value. Recreational shopping behavior was associated with emotional, price, and social value. Impulsive shopping behavior was not related to emotional or price value. Emotional and price values were associated with store satisfaction; however social value was not. Based on these results, store satisfaction may be increased by enhancing the retail experiences in shopping behaviors that are related to the various forms of perceived value.